The staff (Suzy) was terrific and extremely nice. The location was great. The location was perfect. The apartment was great. The people behind the reception were very friendly! The appartment is so nice with full facilities. It’s on a very perfect location. The best part about this place is a receptionist SUZY. She is just love. I was amazed to meet her. A very cooperative & friendly person i have ever met in my life. She made my stay so beautiful. Everything. Staff is very helpful and very friendly. Appartment was incredibly clean, very cozy. Very well furnished. You get absolutely everything that you might need. The view is insane. Definitely will stay there again. Unparalleled view, the best terrace in town... loved this apartment. Everything was good, the staff is very friendly and helpful, the apartment was very clean, the location can't be better. Fantastic place. Lock in a great price for Rybna 9 Apartments – rated 9.3 by recent guests! Rybna 9 Apartments This rating is a reflection of how the property compares to the industry standard when it comes to price, facilities and services available. It's based on a self-evaluation by the property. Use this rating to help choose your stay! 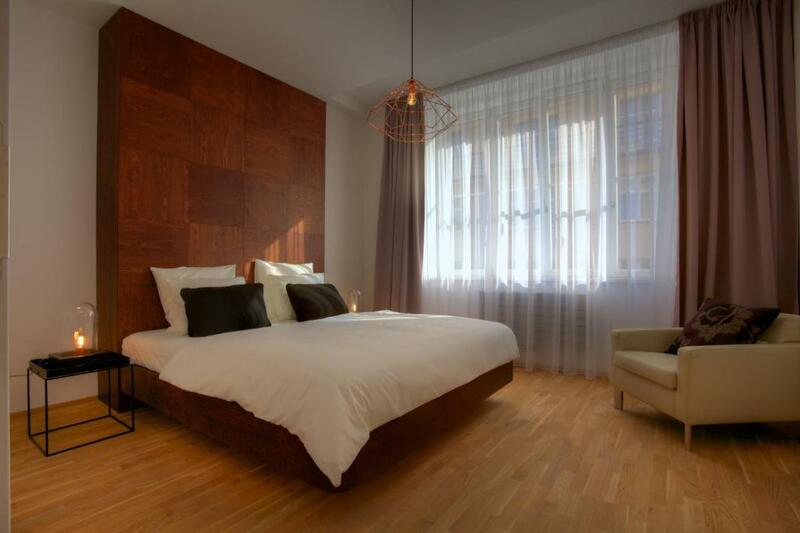 One of our top picks in Prague.The elegant Rybna 9 Apartments is in the heart of Prague, just under a quarter of a mile from the Old Town Square. Guests can enjoy air-conditioned accommodations with free Wi-Fi and modern amenities. A 24-hour front desk is provided for added convenience. All units are stylishly furnished at a high standard. 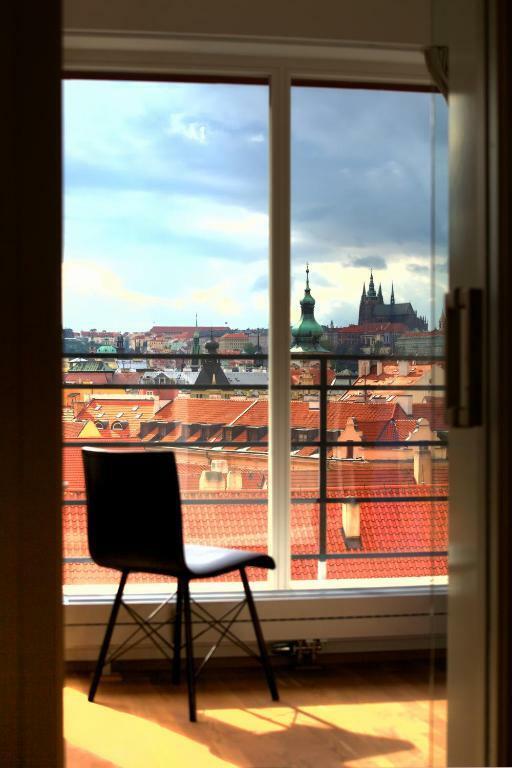 The majority of apartments consist of a terrace or a balcony, some featuring picturesque views of the city's panoramic skyline, including Prague Castle. A flat-screen smart TV with satellite channels and a DVD player are provided in the living room, and a dishwasher is standard in each open-plan kitchen. A washing machine and tumble dryer complete the in-unit facilities. Other services like on-site underground parking (subject to availability), airport transportation, breakfast and grocery deliveries are available for an extra fee. Conveniently located in the center of the city, the nearest grocery store, restaurant and bar are all within 150 feet of the Rybna 9 Apartments. When would you like to stay at Rybna 9 Apartments? 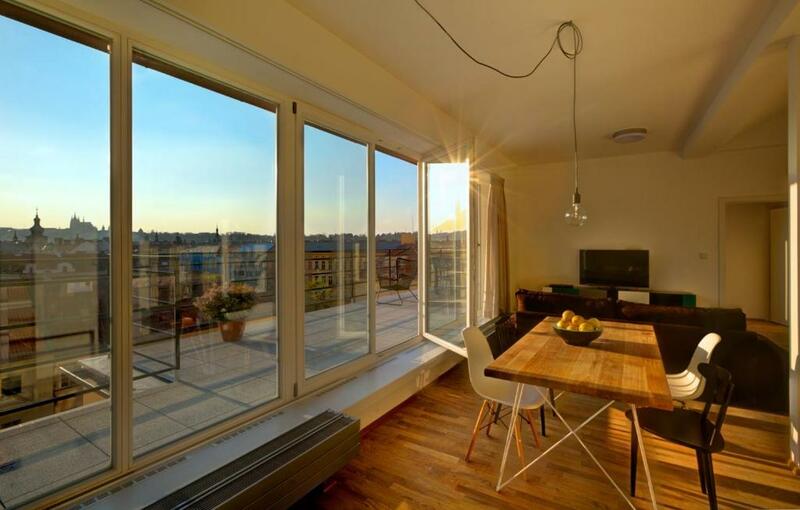 This air-conditioned apartment features free Wi-Fi and a terrace. The open-plan living room includes a full kitchen and a dining area. There are also 3 spacious bedrooms, one of which has a small balcony and a private bathroom (shower and sink only). The main bathroom has a bathtub, a toilet and a sink. There is also an additional toilet. 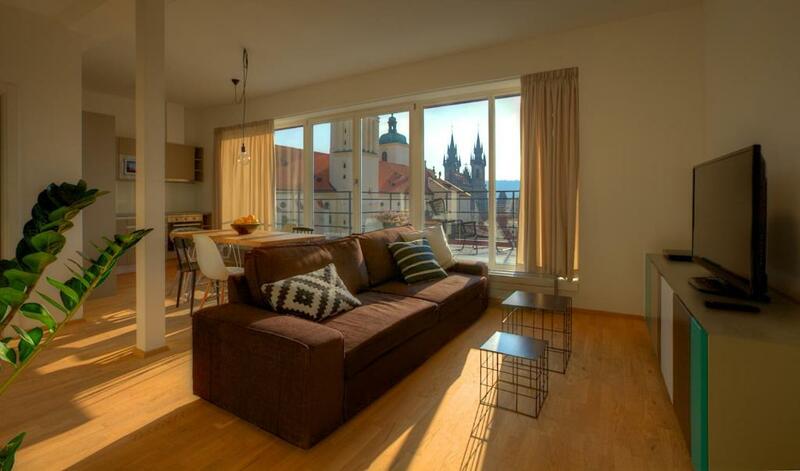 This air-conditioned apartment features free Wi-Fi and a large balcony with panoramic views of Prague and the Prague Castle. The unit includes a large open-plan living room with a full kitchen, a dining area and access to the balcony, as well as 2 bedrooms offering sweeping views and another additional bedroom with a smaller balcony and a private bathroom (shower and sink only). The main bathroom has a bathtub, a shower, a toilet and a sink. There is also an additional toilet. 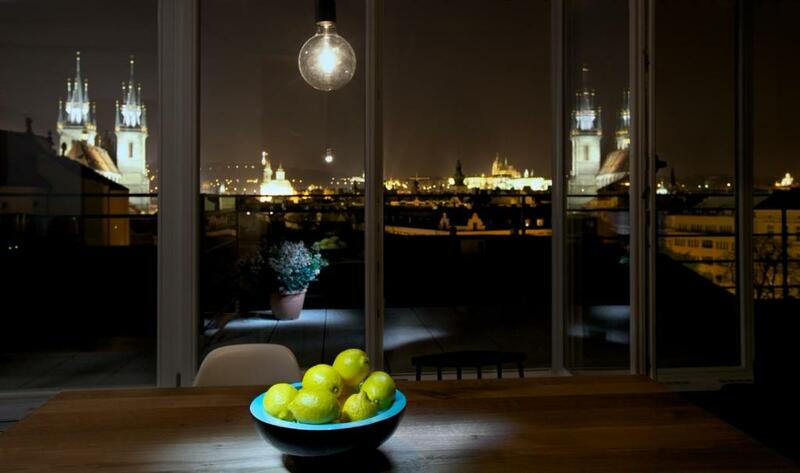 This air-conditioned apartment features free Wi-Fi and a large terrace with a panoramic views of Prague, including Prague Castle. It includes a large open-plan living room with a full kitchen, a dining area and access to the terrace. There is also a bedroom with access to the terrace, another bedroom with a balcony, a private bathroom (shower and sink only), as well as a bathroom with a shower, toilet and sink and an additional toilet. 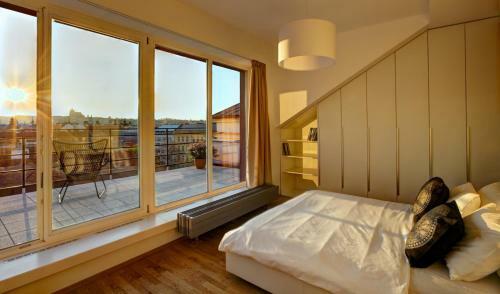 This air-conditioned apartment features free Wi-Fi and a balcony with a panoramic view of Prague and Prague Castle. The accommodations include an open-plan living room with a full kitchen and dining area. Next to the living room is a bedroom with access to the balcony and another with a small balcony and a private bathroom (shower and sink only). The main bathroom has a bathtub, a sink, and a toilet. There is an additional toilet, as well. This air-conditioned apartment features free Wi-Fi and a terrace with a panoramic view of Prague and Prague Castle. The unit includes an open-plan living room with a full kitchen, dining area and access to the terrace. The bedroom has a balcony. There is a bathroom with a bathtub, a toilet and a sink, as well as an additional toilet. This air-conditioned apartment with free Wi-Fi has an open-plan living room with a full kitchen, a dining area and a balcony. The spacious bedroom provides access to the balcony. The bathroom includes a shower, toilet and sink. This air-conditioned apartment with free Wi-Fi has an open-plan living room with a full kitchen, a dining area and a small balcony. The spacious bedroom provides access to the balcony. The bathroom includes a shower, toilet and sink. This air-conditioned apartment with free Wi-Fi has an open-plan living room with a full kitchen and dining area. 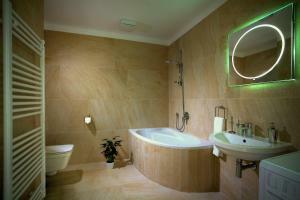 There are also 2 bedrooms, one with access to the terrace and another with a private bathroom (shower, sink, toilet). The second bathroom includes a bathtub and sink and a separate toilet. This air-conditioned apartment with free Wi-Fi includes an open-plan living room with a full kitchen and dining area. There are also 2 spacious bedrooms and 2 bathrooms, one large with a bathtub, shower, toilet and sink and one small with a shower, toilet and sink. Situated in a high standard air-conditioned building with 24-hour reception, free Wi-Fi Internet, lifts and onsite underground parking (subject to availability at extra cost), the Rybna 9 Apartments are a great place to call home while visiting Prague. 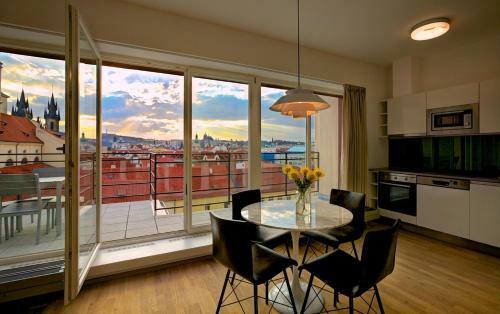 Specific apartments with balconies or terraces overlook Prague's skyline and include direct views of Tyn Church, the monastery of St. James, and the many spires of the city, while other apartments w/ balconies overlook Rybna Street. Prague Stay is the Golden City's premier holiday apartments provider. We offer fully serviced short and medium term apartments in a wide variety of buildings ranging from different architectural eras. The apartments are situated in Prague's sought after neighborhoods of Old Town, Lesser Town, and New Town. The Rybna 9 apartments are situated on Rybna Street, a road in the middle of Old Town that was once home to the city's fish markets. Nearby on Masna Street (meat street) you could find the city's butcher shops. Today the area is home to hip bars, cool international eateries, traditional Czech restaurants and bars, and much more. Old Town Square is a mere five-minute walk from the apartments, as is Republic Square with the Art Nouveau Municipal House. House Rules Rybna 9 Apartments takes special requests – add in the next step! A EUR770 damage deposit is required on arrival (around USD866.63). This deposit will be fully refunded at check-out, as long as there isn't any damage to the property. Rybna 9 Apartments accepts these cards and reserves the right to temporarily hold an amount prior to arrival. Please note that guests requiring a confirmation letter from Rybna 9 Apartments for visa purposes are subject to a nonrefundable fee of the first night's rate. A security deposit via credit card payment of EUR 770 is required upon arrival for incidentals and as a preauthorization of the credit card. This deposit is fully refundable upon check-out and subject to a damage inspection of the accommodations. Please also note that Rybna 9 Apartments may require that you show the provided credit card. The pre-authorization is fully refundable upon check-in / after full payment for your stay. In case you are arriving with children, please contact the property directly. Please note that the parking entrance has size limits - 94 in wide, 209 in long, 83 in high. Please note that breakfast delivery is possible. A damage deposit of EUR 770 is required on arrival. That's about 866.63USD. This will be collected by credit card. You should be reimbursed on check-out. Your deposit will be refunded in full by credit card, subject to an inspection of the property. Please inform Rybna 9 Apartments of your expected arrival time in advance. You can use the Special Requests box when booking, or contact the property directly using the contact details in your confirmation. Would have liked the paperwork for check-in (was a bit lengthy) prior to arrival. Receptionist was wonderfully helpful - let us store our bags there because we arrived early in the morning. We're a family of four (2 adults, 2 kids ages 12 & 8). The room was very large with a great layout, modern but comfortable amenities and extremely clean. Fabulous city views of the major Prague landmarks. Easy walk to all landmarks and wonderful restaurants just steps away along with a little bodega next door. We were disappointed to only have one night here, we loved it and would definitely book it again. The one of the bathroom couldn't be use because it had a very strong smell of waste. Warning light sleeper church bells start at 6am.!!! I have been traveling Europe for past week and can say this is the best apartment. Views fantastic.size fabulous. Couldn’t check availability of the parking place before I made reservation. Located in the old center. Very closed to restaurants and all atractions. Excellent apartment, very clean, very spacious. 3 baths, 2 balconies. Underground parking for the car. Good wi-fi. Average breakfast. The fact that checkout time is 10 in the morning, which is very early by most hotel standards around the world, usually checkout is at noon and 1400 if the receptionist is kind enough. Great location, lovely apartment with all you could want and a very comfy bed and great shower. It was a bit noisy. People outside and some flat neighbors. Location is really good, in the middle of the downtown. The flat is big enough for 4-5 people. It has everything you need even washing machine. The furniture and the balcony are nice. At night, the street becomes a bit noisy, we couldn't sleep well until it became quiet again. The towels in the bathroom were clean and tidy, but they were not smelling good - this can be easily improved. Directly in the old city center, big and well equipped apartment, balcony, underground garage, excellent service at the reception (Susanna).